For our project we tested how quickly different sized fresnel lenses can light a match. Our inspiration for this project was simply that we enjoy burning things and it is interesting to see how a simple lens can create such extreme temperatures. We are doing this project, because when we started the wave project we thought that it would be cool if we could focus heat and light waves to burn different materials. In our experiment we are trying to find out how much time it takes to ignite a match, wood, paper, r-candy (a mix of potassium nitrate and sugar) and alcohol soaked cotton balls with two different sized lenses using only sunlight. A fresnel lens is a lens originally created for use in a light house. The lens is made from an array of prisms arranged in a circular way. This type of lens greatly condenses the lens making it smaller and thinner but at the same time losing the clarity of the lens. For this reason the lens can be used for close up lenses but other thicker lenses are still used in things like cameras and types of photography. This was used in lighthouses so that the light could be seen from a long distance away while staying very bright but not using an extreme amount of power. Its light could be seen from over 20 miles. These lenses are made to be thin and strong and are now used in many things such car headlights and televisions. Our independent variable is the size of the fresnel lenses that are 27 by 36 inch and 36 by 48 inch. Our dependant variable is the time it takes to ignite a match. We predict that a larger sized lense will ignite the faster because it focuses more of the sun’s energy. The next portion of the experiment is observational. We will observe the effects the lenses have on a variety of things. We predict that we will be able to burn all, but the alcohol soaked cotton balls because of their water content. For our experiment we tested how different sized fresnel lenses affected the time it takes to light a match. We started with two huge fresnel lenses. The larger lens is 1,728 square inches and the smaller is 972 square inches. Our dependant variable was how long it takes for a match to light with the sunlight at the same time of day with the two different lenses. Then we used the lenses to light different things on fire. For the first one we used the smaller lens and timed how long it took for the match to ignite. We compared this information to how long it took the large lens to light a match. We then used the smaller of the two lenses and observed how the other four materials lit and burned. (materials stated in the intro) We did the experiment at the same time of day to make sure that our results were not skewed. Experiment 1, For our first experiment we figured out how much time it would take to lite a match using the big lense and the small lense. The small lense took 4.35 seconds to lite the match and larger lense was unable to ignite the match. Experiment 2, the soaked cotton ball turned black ish and then lit up in flames. After this test we tried a piece of wood, this took us longer to get an open flame. It was about twenty seconds after the wood began turning black and chard. When we tried paper, after approximately seconds it would turn black and catch flames. And for the R-candy, it would melt the powdered sugar which would form black little sugar balls and then catch in flames after about 7-8 seconds. Our results showed the smaller lense lit match where as the larger lense could not. This is because the larger fresnel lense was unable to focus the energy to a small enough point. This contradicted our hypothesis. We believed that, because the larger lense has a larger surface area it would be able to focus more of the sun’s energy and create a hotter focal point. Although it was able to focus more energy, the energy was not focused to as small of a point so the energy was dispersed over a larger area. To improve this experiment given I had more time we would construct a stand that would allow us to continually and consistently focus the light at one point for an extended period of time. This would have allowed for more conclusive and reliable results. The second half of our experiment was qualitative rather than quantitative. For this portion of the experiment observed the effects focused solar energy had on different materials. We observed wood, paper, alcohol soaked cotton balls, and a mixture of potassium nitrate and powdered sugar (R-candy). Each material produced a sustained flame in under thirty seconds when exposed to the light waves focused by the smaller fresnel lense. This is a fairly impressive feat considering the ignition temperature of R-candy is approximately 325 degrees celcius. This experiment proved our hypothesis to be mostly true. However our hypothesis predicted us having trouble with the cotton balls because of the water in the alcohol. This was not the case the cotton balls ignited an a very similar manner as the paper. This experiment is not applicable to everyday life, it is more of a curiosity. But if you were ever to find yourself stranded or lost and you had a magnifying glass, camera lense, binoculars or something else with an adequate lense you would have the tool to create a fire that greatly increases your chance of survival. What steps were most challenging to make? The step that was the most challenging to perfect was the marble drop because the ledge the marble sits on was hard to make. The ledge had to be just right because it had to be sturdy enough to balance the marble but still wobbly to have the marble fall of when the other large marbles hit the pipe. We troubleshooted this by making multiple refinement and changing the ledge to the golf tee. Potential Energy is equal to mass times gravity times height mgh. 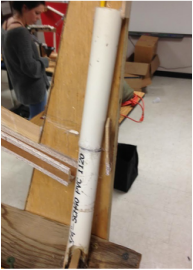 Also, when for example the marble is on the top of the ramp it has the most potential energy. Another concept we learned was conservation of momentum mass one time velocity one equals mass two times velocity 2 M1V1=M2V2. We learned how to construct a Rube Goldberg machine. Specifically, we learned how to solve persevere through tough steps that kept breaking. Also, we learned how to better collaborate as a group. In this project we studied how technology effects people. This is a infographic showing our results for our experiment. 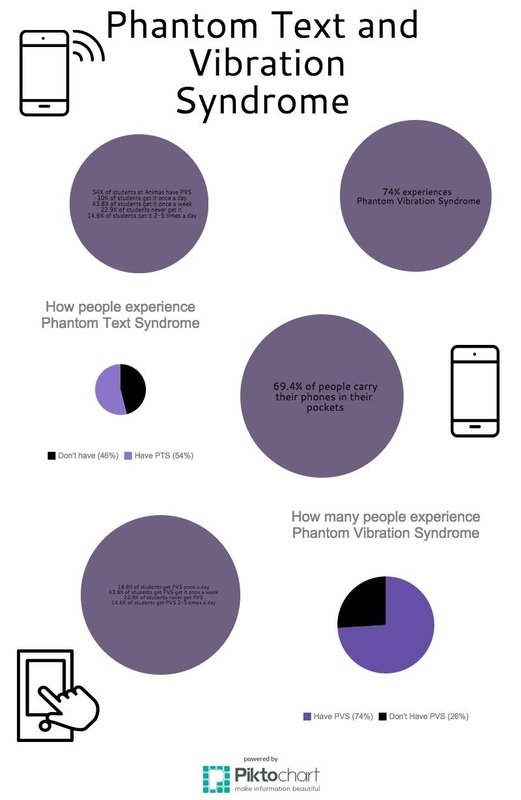 Our experiment was what percent of teachers and students experience phantom vibration syndrome. We wanted to see how many people either experienced the vibration or the sound without it actually happening. We made a google form and sent it out to 50 people students and teachers. After we got all of our results we put them into our infographic. 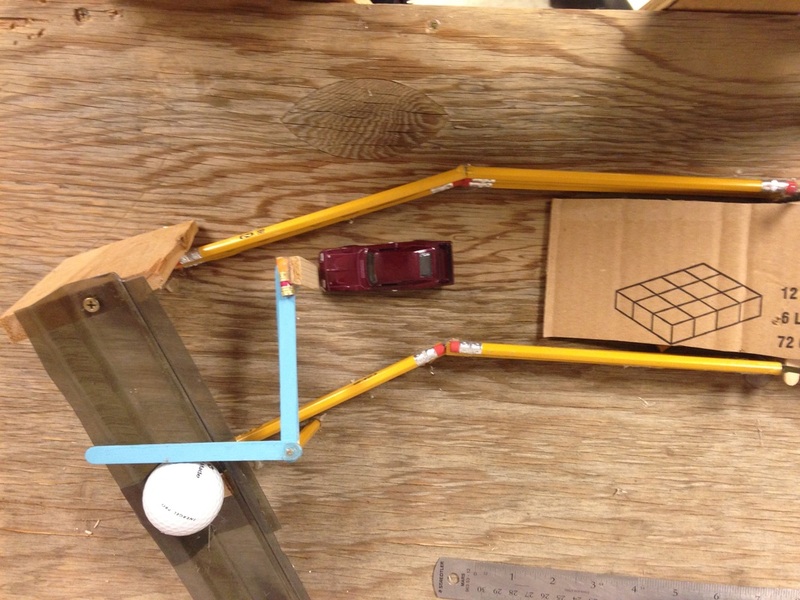 By doing this project I learned how to incorporate technology into a project.